Nav System, Third Row Seat, Heated Leather Seats, Turbo Charged Engine, Power Liftgate, Heated Rear Seat, Rear Air, VOICE-ACTIVATED TOUCH-SCREEN NAVIGATI... TRANSMISSION: 10-SPEED AUTOMATIC W/SE... ENGINE: 3.5L ECOBOOST V6 READ MORE! Leather Seats, Third Row Seat, Power Liftgate, Rear Air, Heated Driver Seat, Heated Rear Seat, Cooled Driver Seat, Back-Up Camera, Running Boards, Premium Sound System, Satellite Radio, iPod/MP3 Input, Onboard Communications System, Trailer Hitch, Aluminum Wheels. Rear Seat Audio Controls, Privacy Glass, Remote Trunk Release, Keyless Entry, Steering Wheel Controls. VOICE-ACTIVATED TOUCH-SCREEN NAVIGATION SYSTEM pinch-to-zoom capability, SiriusXM Traffic and Travel Link, SirusXM Traffic and Travel Link includes a, ENGINE: 3.5L ECOBOOST V6 auto start-stop technology (STD), TRANSMISSION: 10-SPEED AUTOMATIC W/SELECTSHIFT (STD). 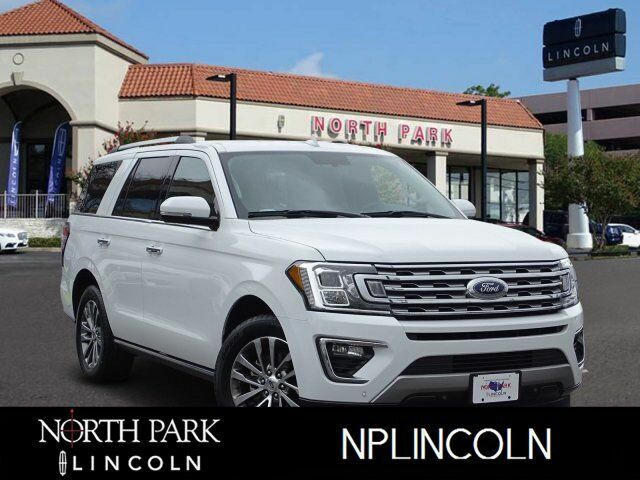 2018 Ford Expedition with Oxford White exterior and Medium Stone interior features a V6 Cylinder Engine with 375 HP at 5000 RPM*. CARFAX 1-Owner KBB.com explains The new Expedition offers excellent towing and hauling capabilities with its 3.5-liter EcoBoost twin-turbo V6 engine, yet manages to return fuel economy more commonly associated with smaller, car-based midsize SUVs..